India, a secular country is not divided by caste, religion, gender etc. But you can make a strong case that one dividing line has actually received too little attention. It’s the line between young and old ones that’s what is called Generation Gap. A Generation gap is a difference of opinion between one generation and another regarding beliefs, politics, or values. Twenty years ago, Hong Kong was already on its way to prosperity. A survey has revealed that 67% of parents in Hong Kong work overtime and they are exhausted after work. The majority could not enjoy family life or were too busy to spend time with families. Therefore, the generation gap between parents and their children have become wider and wider. Now a day’s children don’t like someone to poke their nose in their business and they prefer to spend more time on social media rather than in family gatherings. So, who is responsible for this, the elder ones who is working so hard to earn the bread for their family or the younger ones? To reduce this gap both have to mutually understand each other and try to spend time with each other. As a parent we should have to explain them about each and everything and let them try to take their own decision instead of imposing them, so that they can be mentally independent. Now it’s children’s duty that they should also try to listen to their parents what they want to make them understand. They might be aware of new technologies and they have their own point of view still they should not forget that their parents are one who made them learn the basic moral values of life. As what is called “Old is Gold”. 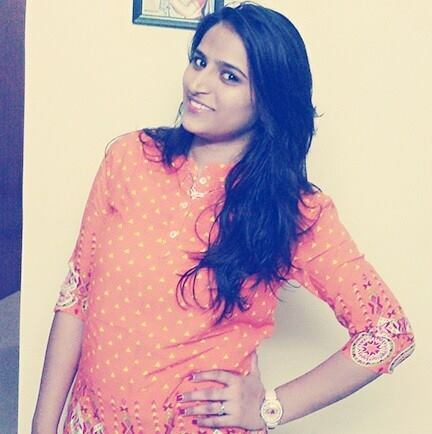 PC: My name is Poornima Choudhary. PC: My batch year was 2012. PC: My batch mates were Sonia, Ravina, Krithika, and Shilpa. 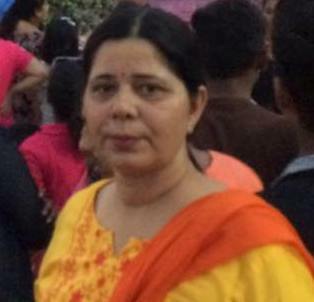 PC: My favourite teacher of my time were Parineeta Ma'am and Jyoita Ma'am. PC: Yes, I have participated in school house activities and archery tournament at state level. PC: I have done my M Com..
PC: It was a great experience I have spent my good days at this school. ED: Would you like to give any message to your juniors, school, or friends etc.? PC: Yes, I would like to say that all of you should be proud to be a Fabindia. Monday, 30th October: Staff had PDP Session on that day. Mr. Krishan Gopal read out a thought ‘मुनाफा सिर्फ परिणाम है ’ from the book “आइसक्रीम मेकर “by सुबीर चौधरी ”. Staff then discussed their opinions, gave their views and uploaded a writ up with graphics and photo in Alchemy of Learning. Thursday, 2nd November: Staff had Skype PDP Session with Chairman, Mr. Sandeep Dutt. First the Minutes of the last Meeting were read out. Update of the minutes and M&E Tool sheet was taken. The final presentation on The Fabindia School Case Study-Schools can Change for the Orlando Retreat in December was shown to the staff and a few additions were made. Staff congratulated School Chairman, Mr, Sandeep Dut on the wedding of his daughter Devyani Dutt. 'May the couple be blessed, lead a prosperous married life and best wishes for their bright future'. They do not harm, they simply grow. As they give us shade for free. And under the shade, rest the cows. The necessary gas called oxygen. And the flowers gives us a pleasant smell. 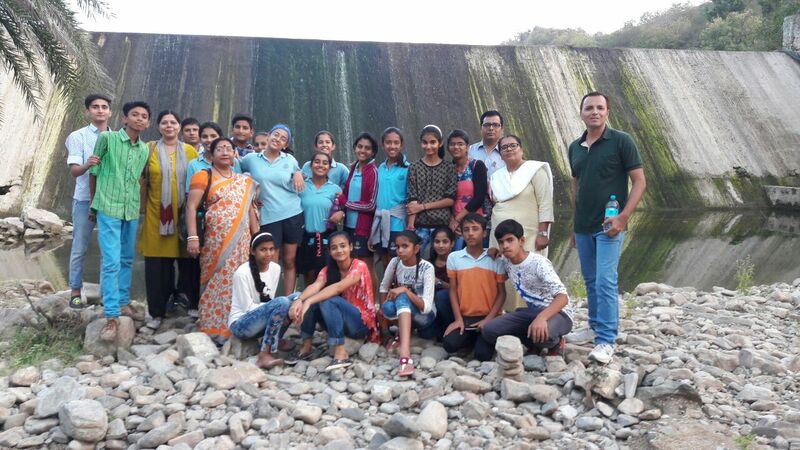 Saturday, 28th October-Wednesday, 2nd November: Six Mayo Girl's School, Ajmer escorted by their teacher Ms Reena Mukerjee (Art& Craft Faculty) and Mr Manoj Bagga (Dance Teacher) visited the School for a Cultural and Art& Craft Exchange Program. They helped the students in exhibitions and dances. They prepared the students for their Grand Finale Dance. They interacted with Class IX Students. They played games with them, had outings and cultural night with them. 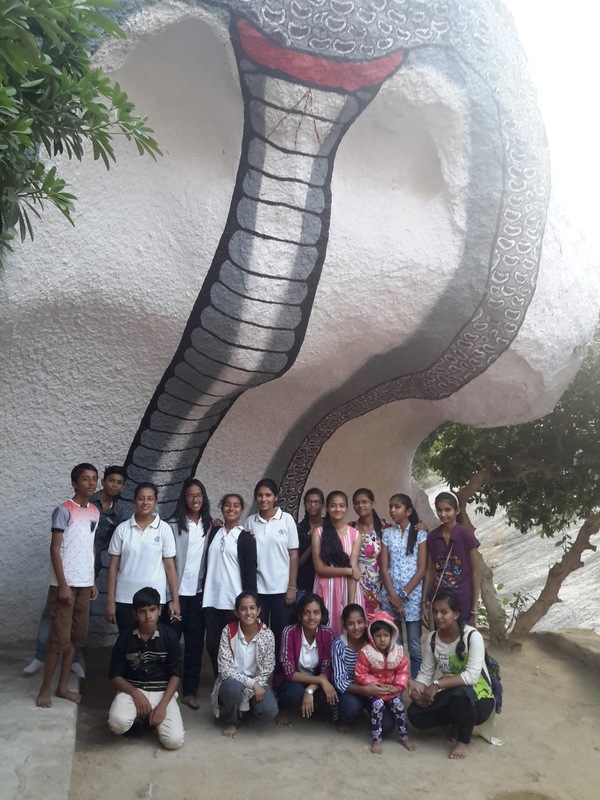 They visited Ranakpur Temple, Jawai Bandh, Thandi Beri and Dantiwara escorted by six teachers. Mayo teachers and girls were given gifts as a token of appreciation. They too had brought down gifts for the Principal and gave gifts to six teachers as a token of appreciation for making their stay comfortable. Diya Tibrewal: I really enjoyed every bit of the exchange. Honestly, we were taken care of in such a nice way and everything was just so homely!! I'm also really going to miss all the friends that everyone of us made on this trip, and I 'm always going to miss this place. Nimrat Dhanoa: The stay was really comfortable, and the food was absolutely lovely!! Every single place that we were taken to was uniquely beautiful, and so were the people. I'm really going to miss everybody, and a big thank you to the staff and the school. We love you!! Stuti Deorah: I really enjoyed teaching them art and craft, and every child here is very talented. The school is lovely and definitely one of its kind, and the staff and our new friends took care of us with everything they had. I'm really going to miss everything. Vanshika Dhaka: Teaching the children something new was an amazing experience, and the teachers and students all have lovely potential and energy. We really enjoyed the visits to places around the district, and we also really loved the school and the hospitality shown to us. Sirjan Kaur: It was truly an amazing experience, and I'm glad I came here and interacted with all these amazing people. I enjoyed every bit of this exchange and hope to see you all again. I'll miss everyone and everything. Thank you so much to the school for having us. Jeevantika Godara: I enjoyed the entire experience very much, and everybody was really nice and the stay was extremely comfortable. Teaching the children art was truly wonderful, and thank you so much to the entire school and students for taking care of us so well. Monday 30th October- Friday 3rd November 2017 The whole week was celebrated as the English Literary Week. 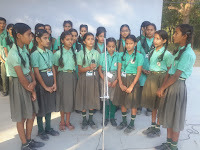 A number of activities were organized in the classes like Poster Writing, Extempore, Spell Bee activity etc. Special Assembly was organized. 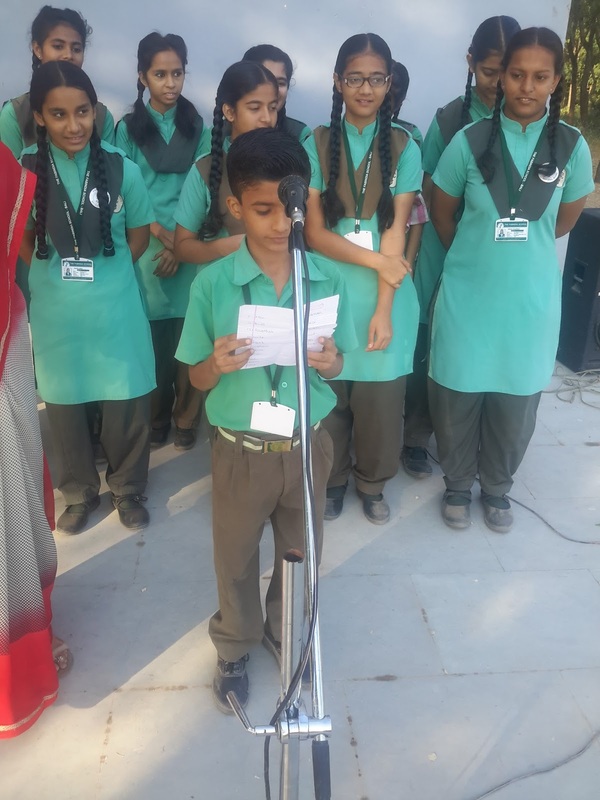 In the Assembly speeches were given, articles were readout, poems were recited and quiz was organized by the students all through the week. Muskan Rathore/ XI: Spoke about the Noble Prize Winners. Chanchal Choudhary/XI: Spoke about William Wordsworth. Meenakshi Choudhary/VIII: Quizzed the Assembly. Ipshita Rathore/VIII: Spoke about Jane Taylor and recited one of her best poem..
Rakesh Suthar/X: Quizzed the Assembly . Suryabhan singh Rao/X: Quizzed the Assembly. Kanak Gehlot/VII: Recited a poem on 'Soldiers'. 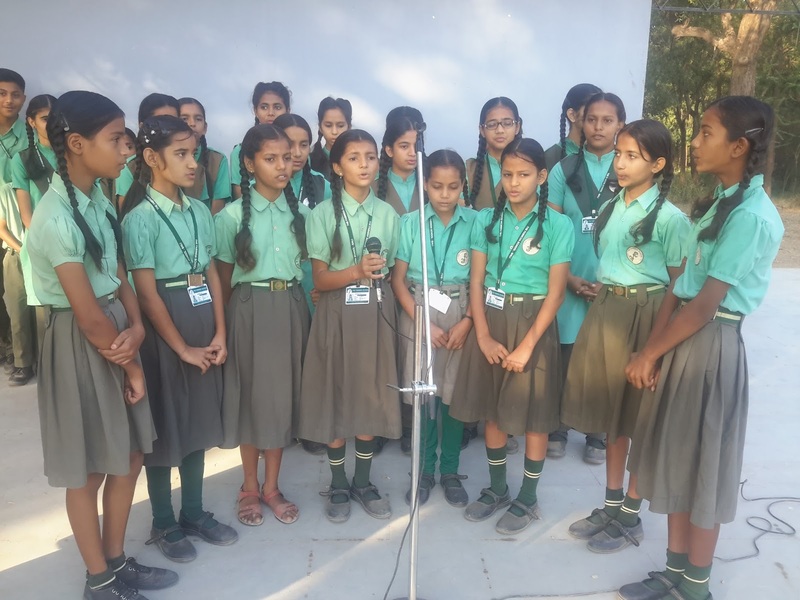 Class V Girls: Sang a group song ' A Hundred Miles'. Kritika Rajpurohit/VII: Recited a poem on 'Diwali'. Priyanka Deora/VII: Recited a poem on 'Mother'. Annual Day’s practices have started in full swing. Monday, 1st November: Gross Motor Skills Activity was organised for the students of Pre-Primary. They learned to throw the ring in the circle, to balance the ring on their head and walk, put thread in the holes and tie their laces.